Brynn Haper’s life has one steadying force–Rachel Maddow. She watches her daily, and after writing to Rachel for a school project–and actually getting a response–Brynn starts drafting e-mails to Rachel but never sending them. Brynn tells Rachel about breaking up with her first serious girlfriend, about her brother Nick’s death, about her passive mother and even worse stepfather, about how she’s stuck in remedial courses at school and is considering dropping out. Then Brynn is confronted with a moral dilemma. One student representative will be allowed to have a voice among the administration in the selection of a new school superintendent. Brynn’s arch nemesis, Adam, and ex-girlfriend, Sarah, believe only Honors students are worthy of the selection committee seat. Brynn feels all students deserve a voice. When she runs for the position, the knives are out. So, she begins to ask herself: What Would Rachel Maddow Do? Although I had never read an epistolary novel before, I so enjoyed Kisner’s book. I found the format to be an effective way to tell Brynn’s story. Her struggles in school–and in the context of her family–were compelling, and the humor sprinkled throughout the novel was a nice touch that drew me in. 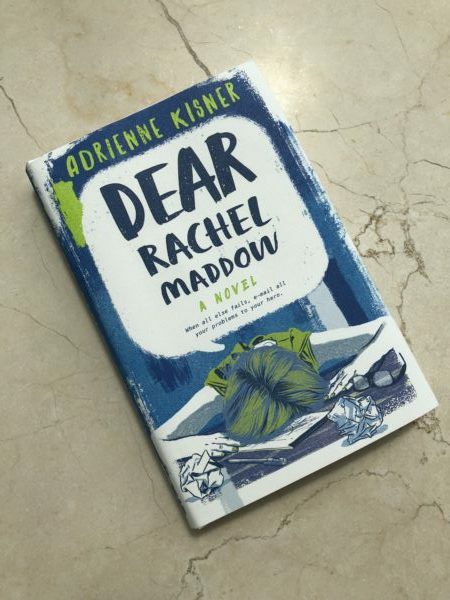 Despite the book’s title, Kisner does not beat readers over the head with politics; instead, she seamlessly weaves in subtle descriptions of Maddow’s personality and show to support Brynn’s admiration for her. Kisner was kind enough to do an email Q & A about the book and her writing life. Here are the highlights. Zied: I read on your blog that you were inspired to write Dear Rachel Maddow after having your first child aka Screamy Baby. Can you elaborate? Kisner: I live on a college campus. Our cable television was great for late-night-don’t-sleep types until one sad day right after my daughter was born. They took away the WE network and I didn’t really know what to do with myself. I aimlessly flipped until I settled on our new assortment of myriad news channels. Rachel Maddow repeated at least twice a night . . . possibly more, my memory from those days is dream-like. Then I discovered her podcast where I could listen to her while doing chores. Things are always new when your short term memory is shot from sleep deprivation. So it’s like it didn’t even repeat. Zied: What is it about Rachel Maddow that led you to make her someone your protagonist reveres/reaches out to (if mainly in spirit)? Zied: To write the book, did you plot or pant, or do some combination of both? Kisner: I’m a pantser, all the way. Plotting baffles me. Zied: Did you have a specific schedule/routine while writing this book? Kisner: None. I have to squeeze in writing whenever I can, around work and family and stuff. I’d have an hour one day, fifteen minutes the next, none for two weeks. Zied: When and how did you decide to use the epistolary format to write this book? Kisner: Initially I’d planned to really rip off the Dear Mr. Henshaw format—write half of it in letters, then go to more of a journal. And it sort of goes like that. But Brynn, the main character, wouldn’t really write in a journal. I think she wanted to connect with someone, outside herself. She’d only write (or dictate) if it were to someone else. Zied: You hold both a master’s and doctorate degree in theology. How do you think your studies have informed or influenced your book (if at all)? Kisner: I don’t know. The longer I went on studying faith, the more I became convinced that people who claim to know God’s will, probably don’t. Mystery and faith seeking understanding and dialogue are stressed in the circles I run in. Here, notions of what “sin” is become more situated in the unknowable mind of God, so I got more and more pissed off that the government should try to legislate off the unknowable mind of God. If anything, the excessive amount of time I spent studying theology gave me a true appreciation for the importance of the Establishment Clause and the Free Exercise Clause in the First Amendment. That people are screwing with that in the name of the ineffable is infuriating and dangerous. Zied: What made you want to write novels for teens? Kisner: Teens are awesome. I don’t understand why everyone doesn’t write for teens. I assume people who write for adults do so because writing for kids is too hard. 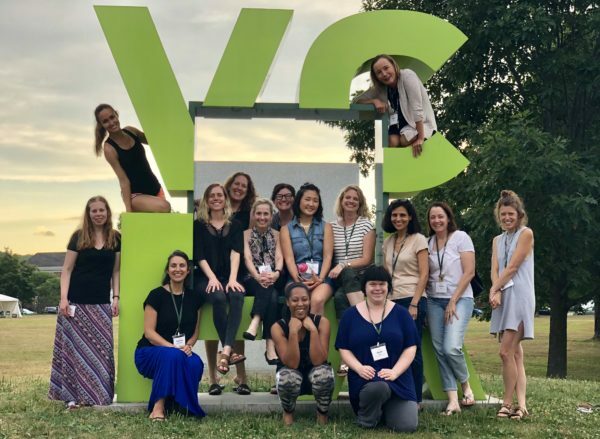 Zied: How did your MFA studies at Vermont College of Fine Arts** help prepare you both creatively and professionally to become a young adult novelist? Kisner: VCFA gave me a community of writers, many of whom are now my best friends. I’ve had other people simply stop talking to me because I was too much or not enough or something tied to my life as a creator of things. That sucked. The inevitable ups and downs of the industry make for a wild ride, too. VCFA gave me lectures to polish my craft, but also gave me mentors and friends who are always in my corner. I love them all. Zied: Have you shared your book with Rachel Maddow (if she’s anything like I’d suspect, she’d be flattered not to mention gracious). Zied: What’s next for you? Kisner: A book about girl birders. I think of it as “Dear Rachel Maddow” meets “The Big Year.” I have dream goals of inspiring a few readers to both vote and go birding. *My like-minded husband and I love Rachel’s ability to tell stories and give context to the ever-changing state of the union. Especially now! **I began my MFA studies at VCFA in July. Read about my writing journey here. To learn more about Dear Rachel Maddow and Kisner’s work, visit her website here.